Mic Stand Extends from 18 to 58"
Mic Stand Folds Down to 17.5"
Intended for on-the-go musicians, the Auray Travelers Mic Stand with Tripod Base is designed for convenience, stability, and durability. It sports a height range of 18 to 58" inches, but quickly collapses down to 17.5", making it easy to store in cases, carry bags, or instrument bags. Relatively lightweight at 2.6 lb, it's very easy to carry about town. This durable stand is constructed out of steel, making it more than suitable for use on the road. It offers a tripod base whose feet are extendable, so uneven floors won't be a problem. Nonslip feet offer an added insurance against traction. With a 5/8"-27 threaded mount, the mic stand can accommodate nearly all microphones. Use it to mic guitar cabs down-low or extend the stand to its maximum height for singers. Need to read sheet music off your tablet? Pick up a separately available tablet adapter to hold up your mobile device, and you'll be able to sight-read your music. Whether you're a singer or a traveling musician, this mic stand can provide a practical solution for your on-the-road gigs. This mic stand has a three-section telescoping shaft with a range from 18 to 58", so you can adjust the mic's height to your own predilections. Onboard thumb locks make it easy to adjust each section and lock it in place. Mic stands are often awkward to carry and frequently don't fit in carry bags. 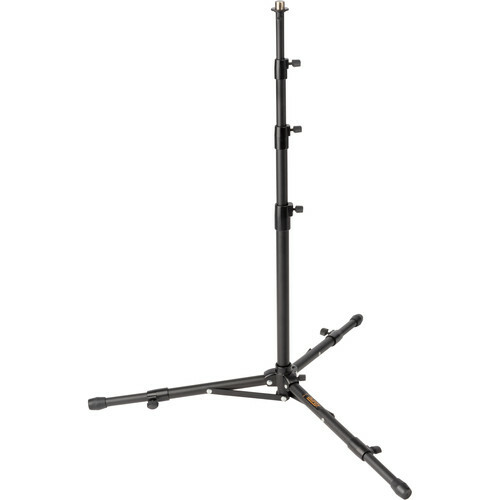 You can fold this stand down to 17.5" and store it in your equipment or instrument bag. The stand is relatively lightweight at 2.6 lb. The base of the tripod offers extendable legs with nonslip feet. Extend the legs for extra stability, and use them to your advantage on uneven floors. Nonslip feet optimize traction to keep the tripod in place. Stands can often see a lot of wear and tear. The steel construction of the Travelers Mic Stand is durable, so you can take it with you on the road without worry. The standard 5/8"-27 mount facilitates attachment of mics or tablets. Connect your favorite microphone, or attach a tablet adapter to use the stand for reading sheet music with your mobile device. Box Dimensions (LxWxH) 18.8 x 3.9 x 3.5"